I’ll start by saying that I’m a fan of open in that the sharing of knowledge is important to me, as is the sharing of sources, not just in software, but in other areas as well. Yes, there’s money to be made, but generally, besides the fact that money allows us to have a place to live, and food to eat, and all the other things needed to survive, I’m not really a fan. Money itself is boring, but it can allow you to do interesting things. I recently posted about the GoPro Hero3 Frame I made. I made it because it was a thing I needed, and didn’t feel like spending $40 on the nice one that GoPro sells. I shared the design files because I thought they might be useful to others. I share things because I’ve gotten so much value out of others sharing things over the years. It’s been over 20 years that I’ve tried to live by that ideal. It mostly works. 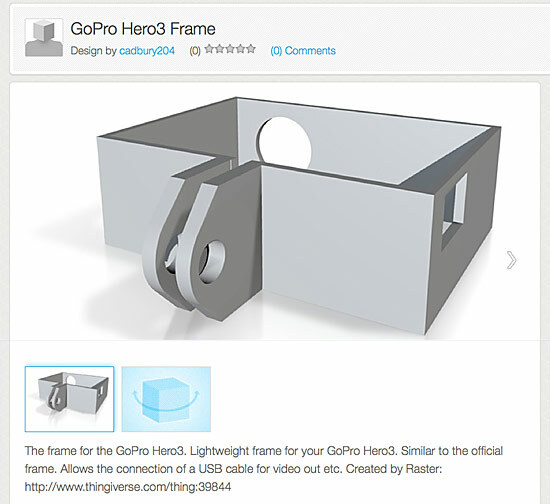 I was quite pleased to see that someone found value in my sharing, and improved upon my design to create GoPro Hero3 Frame – Improved. Again, this is how I want the world to work. I made a thing, and someone else made it better. Everyone wins, right? Holy Crap, that is mine! Yeah, that’s mine. And it’s for sale, but not by me. Here’s where you decide whether to freak out… and to what degree. Now, I designed my item, and shared it freely on Thingiverse, and even used a Creative Commons Attribution License. I specifically wanted others to be able to have it. Mission accomplished, right? Right. If I think about the “spirit” of open source, as it’s ofter referred to, is this “cadbury204″ following it? Are they providing value just by allowing someone to easily order the item through Shapeways? Are they just out to make money from the work of others? Again, I don’t know… I don’t even know if I should care, but I guess I do, mainly because I find it interesting. And, I’m interested to hear what you think about it. Posted on Tuesday, January 8th, 2013 at 7:45 am. Subscribe to the comments feed. Both comments and pings are currently closed. Post on your own blog. Well, it was your choice to not use -NC. Attribution is done. Only you can decide what use you feel comfortable with. Designs I don’t care about or that I want to see integrated into commercial products, I specifically publish without -NC. Others, that I intend to reserve the right to sell physical versions of on eBay I publish CC-BY-NC or CC-BY-NC-SA. This came up once with SuperTuxKart, which is GPL licensed. Somebody was selling CDs of the game on Ebay. The consensus was that this activity was explicitly part of what the GPL allowed, so it was okay. I would agree with Marcus Wolschon that this is what you allowed for when you licensed the design. One way to look at this is that markets are messy places and some people will inevitably get scalped because they failed to adiquately research the item they’re buying. Another perspective is to say that an idea which isn’t spread has low market value. If you love the thing you built, then you should actively work to popularize it. 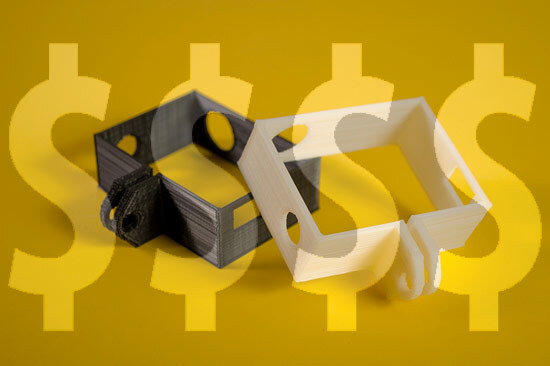 if you’d already put your model on Shapeways as well as thingiverse, then it is far less likely that a copycat product would arise since your design would blanket more of the market. I guess the real question is about how one ought to feel though. And that really comes down to this, does cadbury204 actually do any work for the money they will recieve from selling this item? If Shapeways does all the production and distribution for its vendors then I’d say you have a right to be angry. On the other hand, if this is some individual slaving away over their own reprap machine and handling all the hassle of shipping and order tracking themselves, then the question becomes do you care to compete with their manufacturing and delivery service? Unless you do, the fact that you’re both using the same design seems almost irrelivant. Just to be clear, I’m not that bothered by it, but if I think about the recent Tangibot controversy, the guy behind claimed he was adding value just by cloning someone’s product and making it cheaper. The (loud) voices open source community seemed to believe this was not properly adding value. As mentioned, I was very pleased to see another Thingiverse user improve upon my design and create a derivative–one that I could actually print myself if so desired. They are almost identical… almost. The first, is a disconnect between the popular opinion of Open Source licenses and the legal actuality. A lot of people really don’t know the details of Open Source licenses, even people who use them. (I’m not putting you in that club, Pete.) They think it means, in some undefinable way, that one can only use this for “good”. “Good” meaning any particular person’s idea of good. When in fact the licenses legally say no such thing. Licenses that try to restrict use to various definitions of “good” (for example NC) are generally not valid Open Source licenses. This puts some people (occasionally including me) in a corner. It goes like this “I want to support open source, and I want to see people benefit from it, but for this particular project I’ll be damned if I see someone else make money from it.” So one either chooses an Open Source license and hopes no one notices, or one chooses a less open license and swallows their high ideals. The second is “legal” vs “ethical”. There are lots of things which are perfectly legal to do but are ethically unsound. One can’t legislate ethics, but that’s essentially what contracts and licenses try to do. So someone can act within the letter of the license and still be doing something awful. Tangibot was interesting because Makerbot’s only problem with it was that they used Makerbot’s (trademarked) name all over the site – a legal issue. But most of the community outrage was “Hey’re you’re being a jerk!” or otherwise violating the spirit of the Open Source community. In this case… Well, you can make the case that cadbury204 is adding value (for example, I don’t have a 3D printer) but it’s pretty thin. (All they’re saving me from is downloading from Thingiverse, then uploading to Shapeways.) The markup looks to be either nonexistent or somewhere around a dollar. So… dubious, but not reprehensible. If it bugs you, the way to fight this, within the rules and playing fair, is to simply upload your own copy to Shapeways and sell it for cost. For you there’s the added hassle of uploading it twice, and maybe uploading a photo, but there’s the peace of mind of knowing no one’s going to undercut you. Honestly, if cadbury204 emailed me and said “Hey, I’m selling your thing on Shapeways!” I probably would have said “Cool!” and been a little flattered that someone found it worthy to sell. My first concern was, is there a Shapeways use who just downloads files from Thingiverse and uploads them to Shapeways in an attempt to make money… and again, it’s not that I think I am losing out, I just think it’s not very creative. I value creativity, and I think many supporters of open source do as well. Tangibot was creative only in their attempt at making something cheaper than MakerBot, right? Not very creative. I want to live in a world where creativity is rewarded, and ideas are openly shared. These are some of the reasons I do what I do. You’ve generated a lot of good discussion that was often lost in the heat over Tangibot, Makerbot, and a few other recent OSH uprisings. Great to read! I’ve written a bit about why I choose a Non Commercial license for some projects. It more or less comes down to “I want you you to ask”. Because that’s how decent people act in my world. It is, almost literally, the least you can do. And to date, every single person who has asked has got my permission. I often even help promote the project! I also value creativity, but creativity can’t usefully be put into a license. And if one did it probably wouldn’t be considered an Open Source license. Even Copyright, which has provisions for transformative use, gets incredibly muddy. As long as our expectations meet reality then ruffled feathers can be kept to a minimum. I think we’re in a period of recalibration of expectations. And reality. But to get back to the question of “How should I feel about this?” I don’t really have an answer. I can make a case for either. For me it would come down to “Is the cabury204 clueless or a jerk?” I’d send him or her a polite and curious email and see what the response is. This is an area where sometimes people are not so sure of the protocol in sharing designs. I see that the model on Shapeways now references your design on Thingiverse. I trust the conversation went well then? Duann, I didn’t get to have the conversation yet (it’s been a busy week!) but the copy on the page is the same, with the “Created by Raster: http://www.thingiverse.com/thing:39844” part that was probably put in by the user, and the “Design by cadbury204″ at the top of the page. 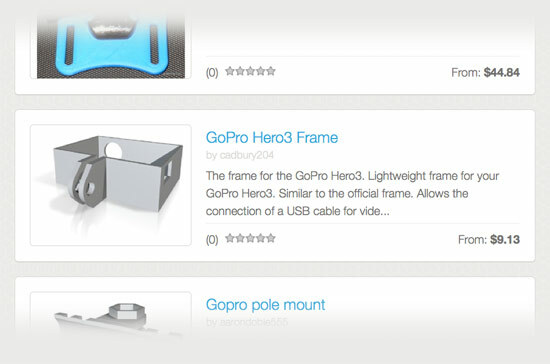 “Design by X” is a function of the Shapeways site that cannot be changed on the product page. Something we may address in the future, a better way of attribution but 99% of designs on Shapeways are submitted by the designer. Also, to my understanding, with a functional object, creative commons does not actually cover the object in a legal sense as it is about copyright, only a patent can protect a functional design. The Creative Commons License is indicative of a social contract which should be respected, but it cannot be relied upon for protection. You explicitly stated others were free to make commercial use of the work. I don’t understand why this is even a conversation. Eamon, it’s a conversation because it’s been a conversation since the dawn of open licenses. I should be clear (again) I am not shocked or upset that someone is selling the object I designed, as I made that possible with the license I chose. As I stated, I’m more interested in what people think about the whole thing. I’ve heard varied responses from people who are makers and are not makers, to people who think I’m being “ripped off” and people who use open licenses, but choose non-commercial options for their things. If we (the people who use open licenses) hope to see the concept reach a wider audience, we’re going to have to deal with the old fashioned thinking many people have about how things should be “protected”.